Everything has a beat. A rhythm. A frequency at which it likes to shake. You can rock most objects off-beat for as long and hard as you like, and not much will happen (see: the career of John Mayer). 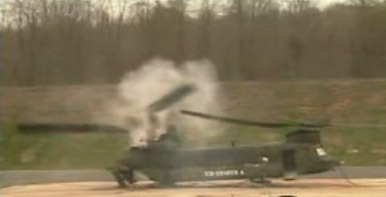 But start to push and pull in time with the natural frequency—the “resonant” frequency—of the object in question, and it will quite literally start to fall apart, much like the helicopter in the video below. I always understood resonant frequencies best by thinking of the old-timey toy the paddleball. This uniquely solitary time-waster—Minesweeper for the Greatest Generation—consists of a bouncy red ball attached by elastic string to a small wooden paddle. Success comes when you hit the ball, the elastic pulls it back to the paddle, and you hit it again. And again and again and again. You quickly notice that there’s only one frequency that works, only one rhythm that prevents you from flailing wildly at the stupid little red ball. This is the paddle’s resonant frequency, and in this case, it’s a good thing. Not so when dealing with bridges, skyscrapers or helicopters, however. Shake these at their resonant frequency, and the back-and-forth motion spells trouble. Each push adds more and more energy to the object—energy that, if not dissipated, starts to wreak havoc. That’s what happens with our Chinook. The rotating blades begin to shake the airframe at its resonant frequency, and physics takes care of the rest: Because the blades are unable to dissipate the excess energy, the convulsions rend them from the fuselage. According to PopSci’s aviation expert, Bill Sweetman, helicopters are prone to resonant effects, which is why resonance ground testing (as seen in this video) is a standard part of chopper R&D. If both blades in a twin-rotor helicopter share the same heavy vibration and the engine mounts aren’t rock-solid, the energy generated can actually make the motors start moving around the engine mounts, and the next thing you know, that bird’s goose is cooked. For a side view of the same test, click here. Without doubt, Ovation Guitar is one of the best guitars available in the market today. I have some at home, I pertecem since I started my band (the garage! ), But is following me. Today we have 15 years of road, and always on the side of my Ovation Guitar. The latter bought a site with many interesting offers (I'l leave the link for you guys: http://bit.ly/nKC7F ). Today, my last purchase on this site was a Custom Elite, for a great price! What classic rock band or musician, that is still around today has progressed the most? What classic rock band or musician has successfully adapted to the changing times and found new audiences as well as keeping the old? checked the video.its really interesting though something that was fearing .Nice blog.I must appreciate the author every time the author keeps on posting the topics really to social life.I am impressed. I saw this video very smart. Today we have 15 years of road, and always on the side of my Ovation Guitar.